Follow in the footsteps of legends on a 16-day journey to an iconic symbol of challenge and adventure. Selected by Outside Magazine as one of 28 Best Trips of 2016. At 29,035 feet, Everest soars high against a backdrop of vast blue sky. Our expert staff has dialed in every detail of the journey; providing insider perspectives and supportive tips throughout the journey. The classic Everest Base Camp Trek begins and ends in Kathmandu. Nestled between mountains and plains, the city is alive with energy. Explore villages dotted with fluttering prayer flags and become familiar with colorful Buddhist and Hindu traditions. Spend several days hiking to surrounding villages, discovering remote monastic caves and acclimatizing the body to the elevation. 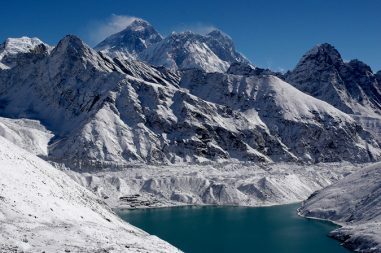 See the fabled Khumbu Ice Fall and its towering Sera from a distance. From there, we hike 18,100 feet to the summit of Kalapatar for an unobstructed view of Everest’s windblown summit. We return home to tell tales of our legendary adventure. This trip requires that one or more internal flights be booked separately by Bharal Adventure. Our travel specialists will collect payment and make reservations for all confirmed group members for these required internal flights. Because airfare prices can change without notice, all flight prices are subject to change. There are two ideal "weather windows" for Nepal. From the latter half of March until the first part of May temperatures are relatively warm, 10° to 15° warmer than in the fall. Mornings are bright and clear with the air slowly becoming hazier as the day progresses. The rhododendron forests in springtime are spectacular, with color displays that are "Himalayan" in beauty. June is warm and green with very few other trekkers – the sense of solitude is much greater than other seasons. However, it is more likely to include rain showers, hazy skies, wet and muddy trail conditions and possible flight delays. Afternoon rain showers do occur in June and mountain views can be sporadic or interspersed with clouds. The fall season, the latter half of October through December, is an ideal time for the best mountain views. The days are typically sunny and clear with moderate temperatures and the evenings are usually quite cold...frosty, to be exact. Trekking to the very high Mt. Everest Base Camp region (at more than 17,000 feet) can include 0° temperatures at night and a 50% chance of some snow anytime above the 13,000 foot level. During the day, above 15,000 feet, do not anticipate temperatures above 35°. Again, since your body is taking in less than half its normal supply of oxygen, 32° will feel colder than we are accustomed to at home. You may arrive at Kathmandu at any time. You will be welcomed by one of our airport representatives. He will help you get transferred to your hotel. Further details about the plans and programs will also be provided. Overnight at Hotel. The Kathmandu valley has one of the densest concentrations of heritage sites. The Kathmandu city alone holds four heritage sites that are listed under the UNESCO World Heritage Sites List. The tour will start late in the morning and you will visit the heritage sites of the city that includes the Temple of Pashupatinath, the Boudhanath Stupa, the Swayambhunath Temple and the Kathmandu Durbar Square. All of these sites are revered by the people of the city and the religious places are held in high regards by the Hindu and the Buddhist people. The Durbar Square of Kathmandu holds many old palaces, buildings, temples and statues from medieval times. The buildings are built in unique Nepali architecture and contain amazing wood-crafting, stone masonry, metal works and intricate carvings done on their doors and windows. Pashupatinath is considered the most sacred temple of Lord Shiva and the cremation ceremony of the Hindus can be seen along the Bagmati’s river bank. Bouddhanath is the largest Buddhist Mandala in the world and the Swayambhunath- located atop a hill, is a temple sacred to both the Hindu and the Buddhist people. The heritage sites provide good insight into Nepal’s history and it’s past. They are great carriers of the country’s cultural and religious tenor. After the tour, you will return back to the hotel. Overnight stay at the Hotel. Meals: Breakfast included. 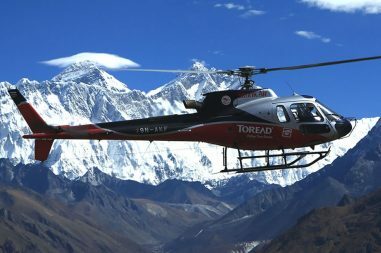 From Kathmandu, a flight to Lukla commences the trek. 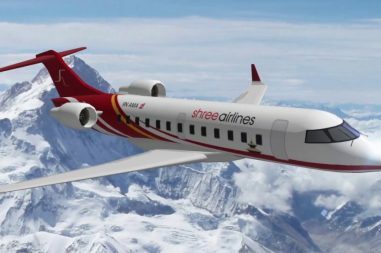 The Lukla flight is one of the most dramatic short flights in the world. The Lukla Airport itself is located on a hill and contains a single runway that drops off towards its end to the deep gaping valley below. Surrounded by tall mountains and jaded hills, the airstrip at Lukla is quite fascinating and the flight is deemed as a little thrilling adventure in itself. Upon arriving at Lukla, the change in the scenery is immediately felt. The mountainous landscape becomes quite prominent and the air carries a crisp freshness to it that only Himalayan atmosphere carries. From Lukla, the trekking trail slowly moves towards the Cheplung Village. View of the sacred Mount Khumbila from the village at Cheplung is beautiful. From there, a gradual walk downwards leads to the village of Phakding. The terrain is amazing and tall hills surround the trail like giant mounds of emeralds. From Phakding, the sight of the Kusum Kangraru Mountain can be seen. The village of Phakding lies in the Dudh Koshi River valley north of Lukla and contains many guesthouses and lodges that cater to tourists and trekkers. Overnight stay at the Guesthouse. Meals: Breakfast, Lunch, and Dinner included. After breakfast at Phakding, the trail further opens out to reach the celebrated mountain town of Namche Bazaar. En route to Namche, several smaller villages are crossed, like Jorsale and Monjo. 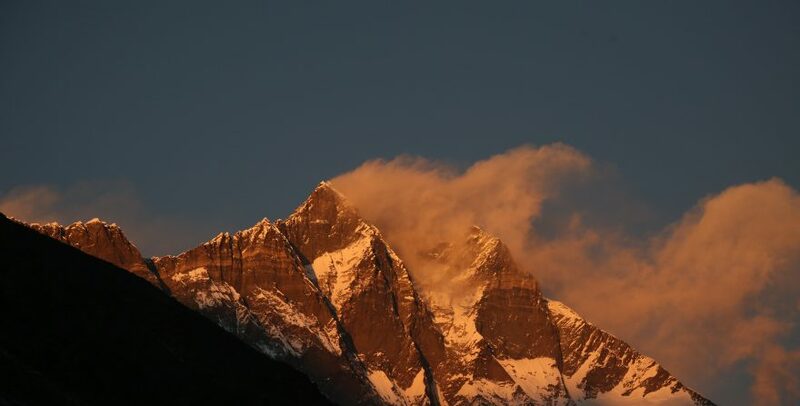 Monjo lies north of Phakding and is the entry point of the Sagarmatha National Park. The trail ventures through the national park and finally arrives at Namche. Walking along the trekking route through the Sagarmatha National Park presents many virtues, like its alpine woods, small rivers and brooks and deciduous forests. Thick acreages of Pine and Cedar cover the lands and provide a pleasant atmosphere to trek through. Namche Bazaar, because of its strategic location, is the commercial hub of the Khumbu region. It is located on a mountainside and views of the Thamserku Peak and the Kongdi RI Himal from here are amazing. Overnight stay at the Guesthouse. Meals: Breakfast, Lunch and Dinner included.